How did you meet? Jake and I met in high school 10 years ago and became very close friends prior to ending up together only 3 years ago. We got together on New Year’s Eve in the drunken spirit of things which turned out to be the best risk I’ve ever taken. Tell me about the proposal…We were on holiday in Darwin for my birthday and after specifically requesting that we don’t do anything special other than drink, dance and definitely end the evening with a kebab I was surprised when he took me out to a fancy restaurant for dinner. We went for a walk and Jake was so fidgety and sweaty (not just from Darwin humidity) and he got down on one knee and asked me to be his wife. I still get goose bumps when I think about the look in his eye and the rush I felt knowing that we were about to embark on a lifetime adventure together. What was the first decision you made when planning your wedding? Our first decision after the venue was our Celebrant. I wanted to make sure that regardless of organising everything else we had the venue and the Celebrant so that no matter what the wedding would go ahead on the day! How did you both plan the wedding? 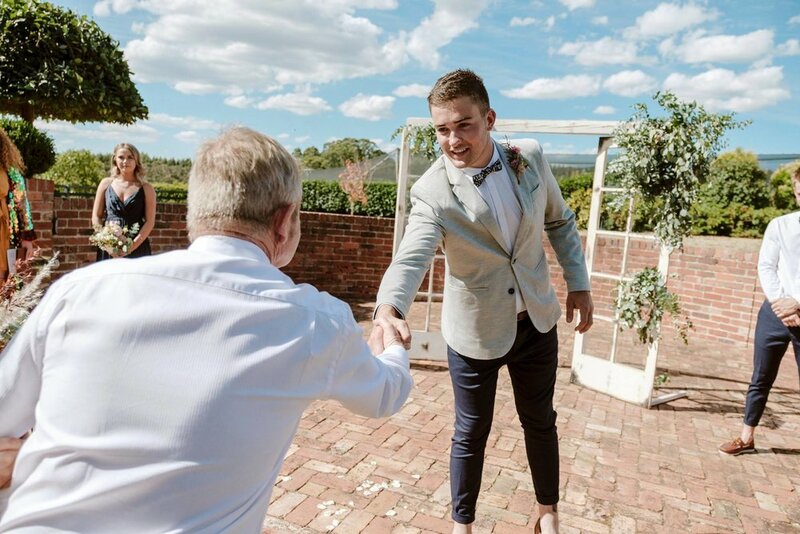 I took on a lot of the planning, mostly because if I am being honest I’m a bit of a control freak and Jake was happy to hand over the reigns anyway! We both wanted the same thing which was a relaxed wedding that felt more like a party so there weren’t any major compromises that were necessary. How did you feel in the lead up to the wedding? Surprisingly calm - the last few weeks I was slightly manic making sure the last few niggly things were organised but I combated this by making lists and delegating tasks. Crossing things off my lists was soothing and having others help me ensured that I wasn’t taking on too much. But the day before I felt like a calm set over me, I had organised what I could and realised I couldn’t control how the day would actually go, all I knew is that I would be married to the love of my life by the end of it and this soothed my nerves. What was the best piece of advice you were given in the lead up? Don’t stress the small things - so you didn’t get some of your decorations set up in time, so what? Your guests don’t know the exact vision you had in your mind and won’t miss the tiny details. How has life changed after your wedding? It hasn’t really, apart from the fact that I get to say “my husband” now which has a GREAT ring to it! What’s your best piece of advice for couples that are arranging their wedding? Do what feels right for you as a couple - I had so many people who felt the need to comment on the lack of tradition in the planning of our ceremony and even reception (we had no cake, no flowers being thrown and no speeches) in the lead up to the big day. But that was what we wanted and it was perfect to us and on the day everyone kept telling us it was the best wedding they had ever been to so it goes to show that going with your gut pays off! Who was your favourite, stand out vendor? Holy moly, Toby Stocks Photography HANDS DOWN!! Never have I met someone with such enthusiasm for their career, he kept us laughing the whole day and made sure we were comfortable and happy throughout. He has a true passion for his job which is evident in his amazing photography. Anything unexpected happen on the day? Unexpected? Definitely! 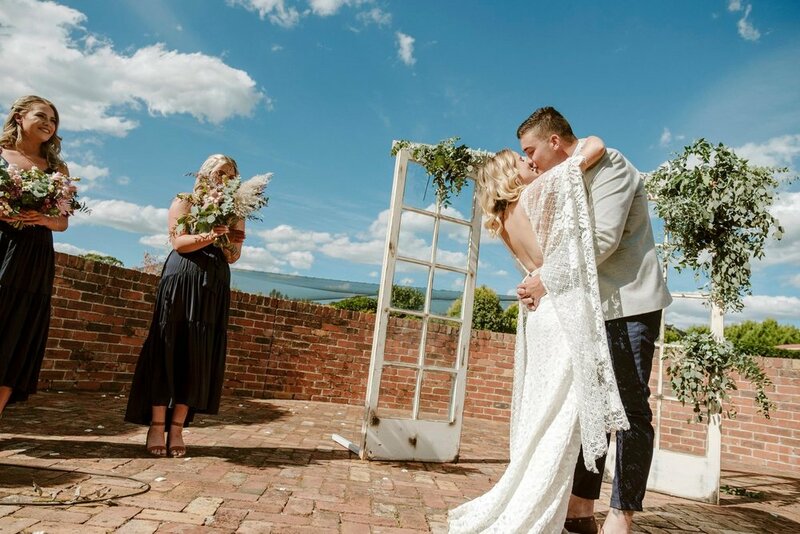 Little did Jake and I know that we would be using our ceremony and our gorgeous celebrant to help us tell our loved ones from all walks of life that we are PREGNANT!! I certainly didn’t expect to be combatting morning sickness, a baby bump and a strong aversion to meat on my wedding day but I couldn’t be happier with this particular unexpected surprise.